Leila is a recent birthday girl and her first year of life was nothing short of adventurous. She got wet and sandy at the beach, covered in burs on a camping trip, knocked over playing soccer with the neighboorhood kids and even able to ruin some household items in her spare time. 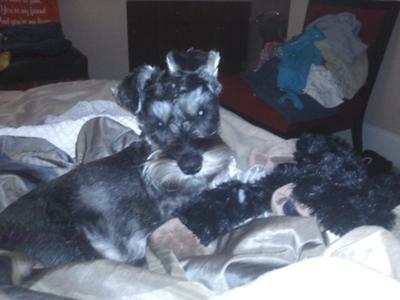 Although she finds trouble everywhere she goes, we have never had a dull moment with our upbeat and energetic schnauzer. She's so pretty!!! Sounds like a schnauzer to me, always getting into something. Then they give you that look and it's all okay! haha Happy Birthday RebeL! We take Bella to St, George Island near you once a year!